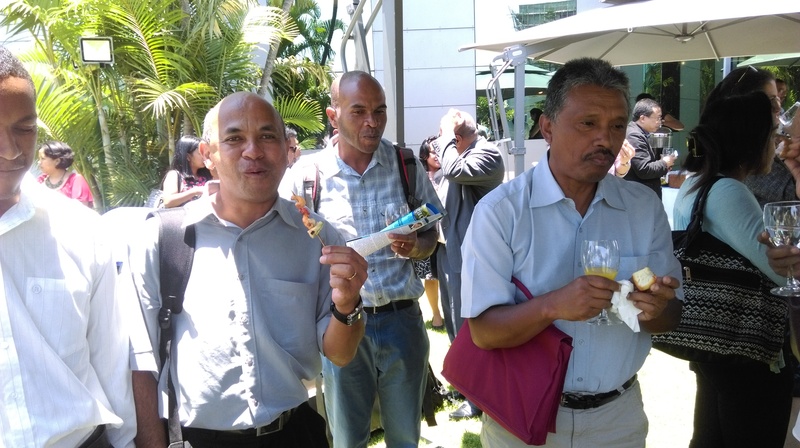 On the 27th January p4ges held an event to share the most policy-relevant results from the p4ges project with government, NGO and donor community who are involved in shaping and implementing policy surrounding forest conservation, restoration and REDD+ in Madagascar. 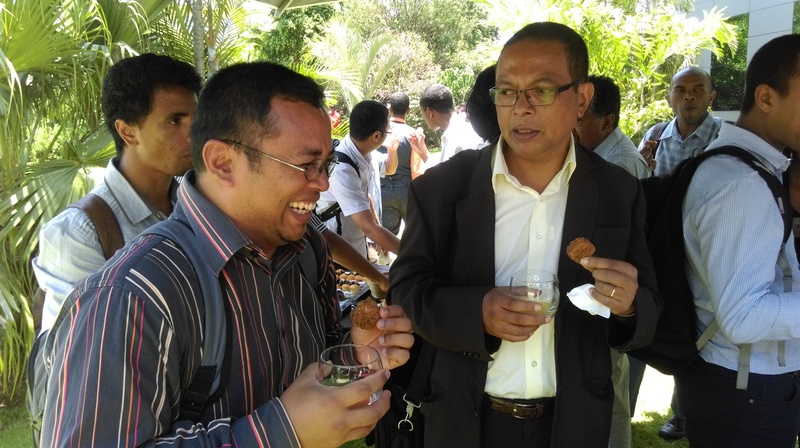 We were extremely honoured that the event was attended by two ministers of state: Mme Johannita Ndahimananjara from the Ministry of Environment, Ecology and Forests, and Mme Monique Rasoazananera from the Ministry of Research and Higher Education. Both ministers gave excellent opening speeches. Mme Dahimananjara reminded us of the importance of the environment for underpinning human development-using the recent water and hydro power shortages in Madagascar to emphasise this point. Mme Rasoazananera emphasised the importance of research for evidence-based policy making and stressing the value of research on current pressing issues such as linkages between the environment and poverty. Julia Jones (Bangor University), Julie Razafimanahaka (Madagasikara Voakajy), Herintsitohaina Razakamanarivo (Laboratoire des Radio-Isotopes-University of Antananarivo) and Luciano Andriamaro (Conservation International) presented the context of the project and key research findings. Bruno Ramamonjisoa (University of Antananarivo) then led a dynamic discussion focusing on the main lessons which could be learnt for the current policy processes in Madagascar. We gave all our visitors copies of policies briefs in French and English which summarised the 10 papers we have already published in international journals. We also gave them copies of our local communication booklet and flash disks containing all of this and lots more (e.g. training materials for the policy support tools Co$ting Nature and Water World). The very engaged audience asked may excellent questions across the full range of p4ges research and from a range of perspective. There were technical questions about the hydrological modelling carried out and the extent to which these models can be used by others (we were able to confirm that the models are freely available and training materials are available on our website and the flash disk distributed). There was a lot of interest in our hydrological research which is seen as particularly timely given the current water shortages in Madagascar and the recent ministerial announcement about the importance of significant restoration of degraded land in Madagascar. Another area which attracted a lot of discussion was the question of costs of conservation and the lessons which could be taken from this research for the development of the new social safeguards for the national REDD+ strategy in Madagascar (which is currently being developed). There was also an active debate about the importance of considering the hidden carbon pools (those in soil) in REDD+ monitoring and evaluation and the challenges that this presents. The p4ges carbon team presented their science which shows that these pools appear to be retained to some extent in cleared land and this needs to be considered in REDD+ policy at the landscape scale. National policies around sustainable agricultural production interlock here with climate change mitigation and related policies and soil ecosystem services are of central importance to both. The event was closed by Sally Harrison from the British Embassy (representing the British government as the funding for p4ges came from the UK). Sally emphasised the UK and Madagascar’s commitments to the Sustainable Development Goals and echoed Mme Rasoazananera (the Minister of Higher Education and Research) comments on the importance of evidence and research for making the best possible policy decisions. After the formal event ended, the leaders of p4ges had a meeting with our National Advisory Committee. This expert group includes representatives from the Office National pour L'Environnement (ONE), The World Bank WAVES programme, the National Coordination Office of REDD+ as well as NGOs involved in REDD+ and forest conservation. It is chaired by Mme Claudine Ramiarison (Ministry of Research and Higher Education). We had a really helpful discussion about the next steps for ensuring p4ges research is as available as possible to be used. One thing which was agreed was to put p4ges papers and archived data sets on the ONE website. We also agreed that the carbon data will be shared immediately with the national REDD+ office to be integrated into their current work on establishing the national Reference Emission Level. 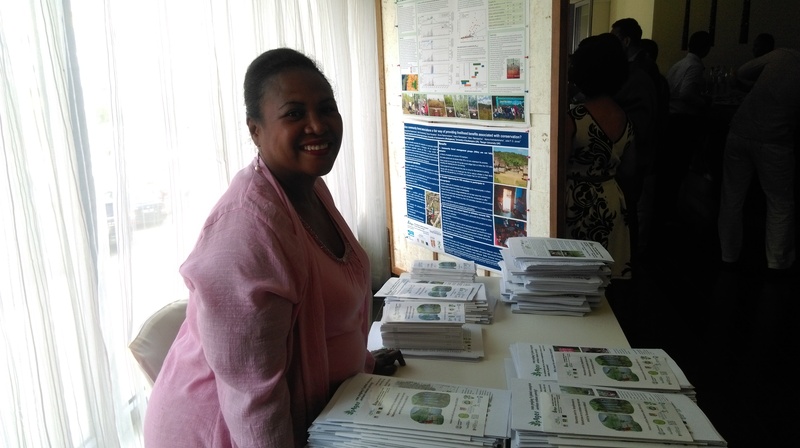 Mme Claudine closed the event by commenting on how impressed she was by the quality of the research conducted by p4ges and that she hopes to see the collaborations which have been developed, continue into the future as this is a very important area for Madagascar.